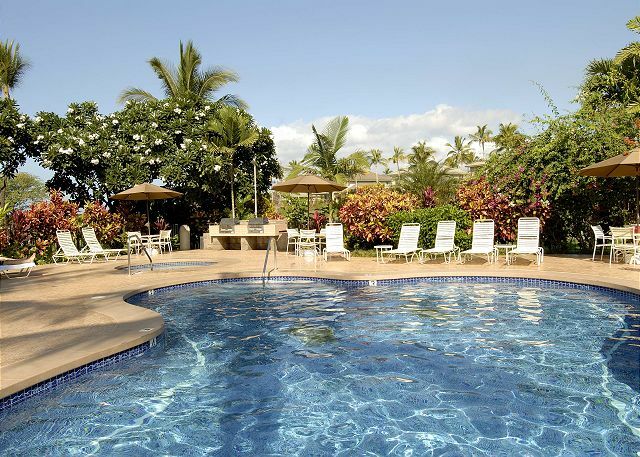 Palm trees swaying in the breeze, tropical air filling your senses, and a great ocean view are waiting for you in Maui! Grand Champions 86 is a one bedroom, two-bathroom condo that sleeps two guests. Enjoy the incredible master bedroom, the private balcony with breathtaking views of the ocean, free WiFi and the wonderful community pools. 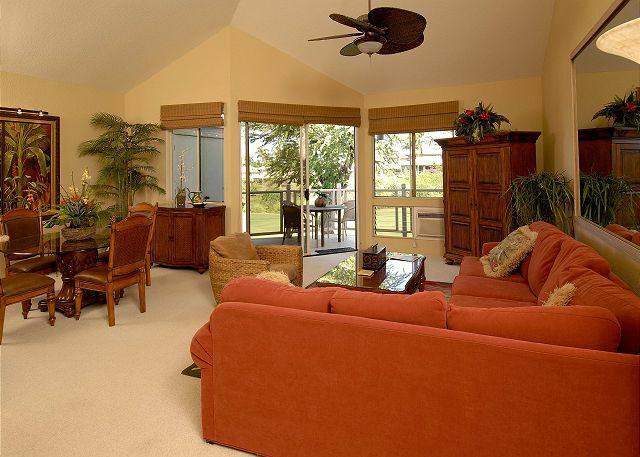 This condo is spacious and beautifully decorated. As you enter, you will notice the open concept and the amazing floor to ceiling windows and sliding glass door in the main living space. The living room features a large sectional sofa as well as a chair situated around the large flat screen television. 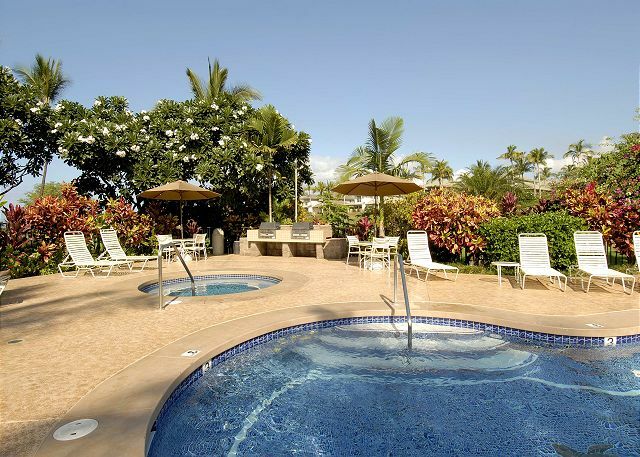 There is plenty of seating for all your guests to sit back and cool off after a day in the Maui sunshine. 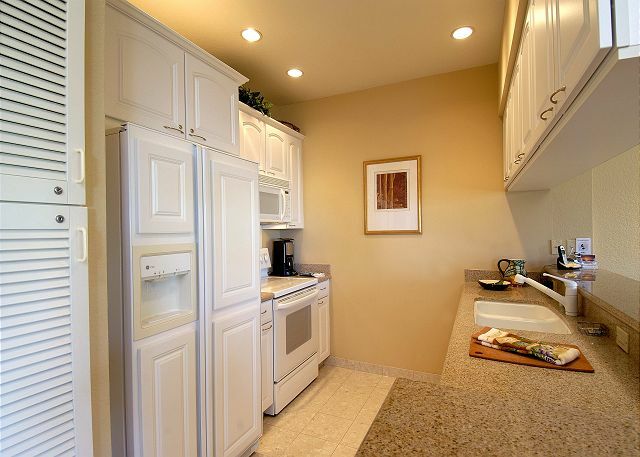 The kitchen features white appliances and plenty of counter space. The kitchen offers an open concept which enables you and your guests to enjoy each other in all of the main living spaces. It is fully equipped with a dishwasher, microwave, refrigerator and freezer, stove top with oven as well as cooking and eating utensils to cook up some delicious meals during your stay. 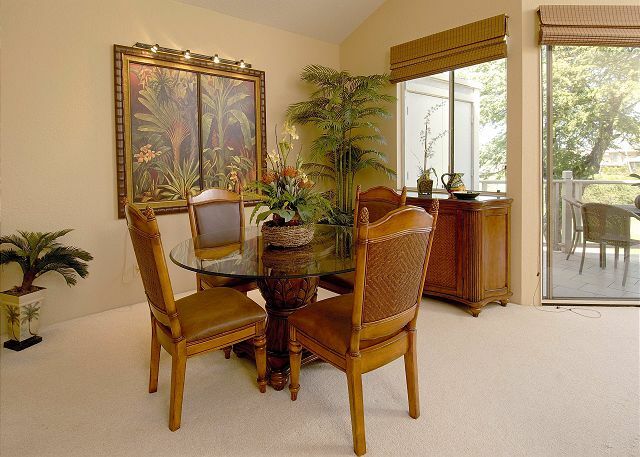 The dining area provides a dining room table with seating for four. You and your guests will enjoy your stay at Grand Champions 86. 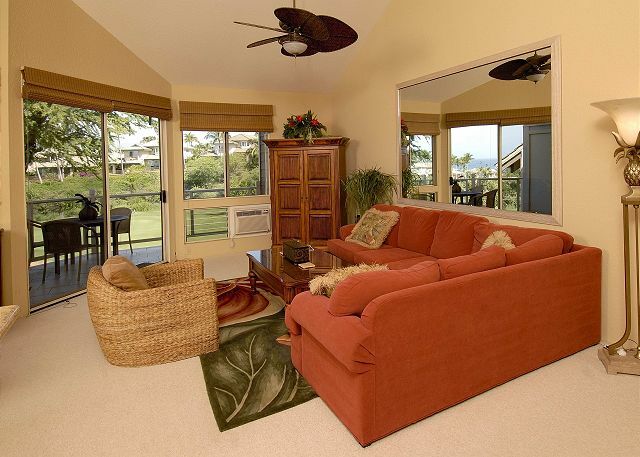 Take a step out on the large balcony and enjoy the sounds of nature and the peaceful ocean view from Grand Champions 86. The balcony provides the perfect spot to enjoy your morning coffee or your favorite cold beverage at the end of the day. Enjoy diving into a good book as you relax in the privacy of your balcony. This unit provides seating on the balcony to allow you to sit back and relax after a long day in the sun. You cannot deny how amazing your view is from Grand Champions 86! Grand Champions 86 features an amazing master bedroom with a king-sized bed, a dresser and plenty of space to make yourself feel right at home. The master bedroom is outfitted with beautiful furnishings. Enjoy the convenience of the in-suite bathroom providing all the necessities for your stay. 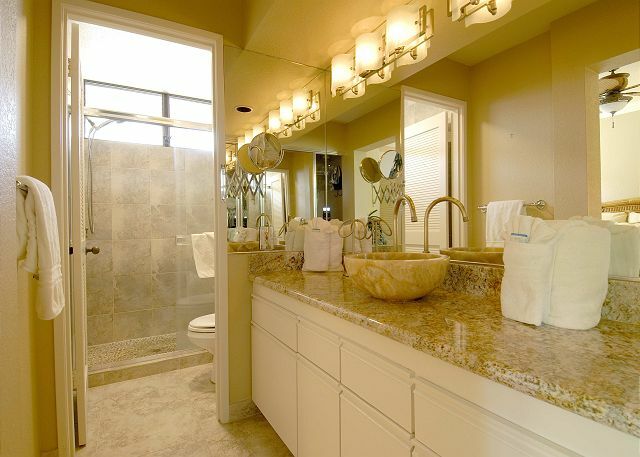 A gorgeous walk-in shower and a large vanity will provide you everything you need. 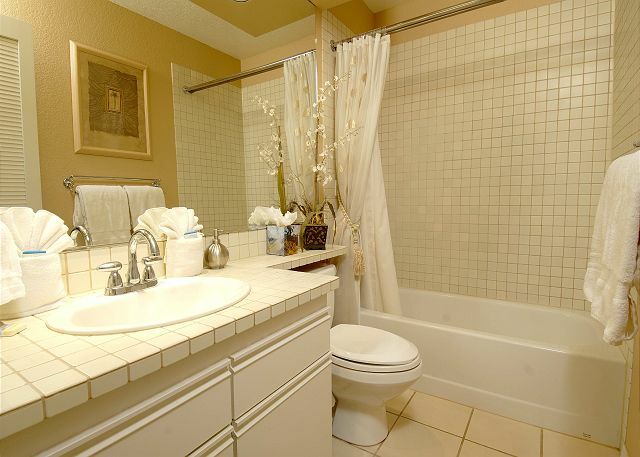 A second full bathroom is also provided in this condo. Bed linens and towels are provided for all guests to use during your stay. 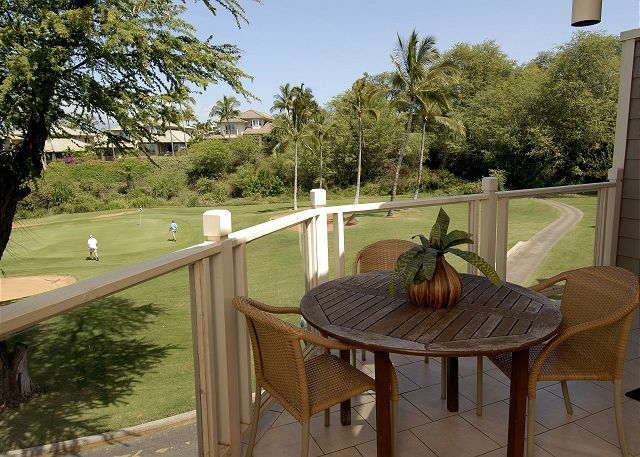 Grand Champions 86 is located in the Wailea Resort which offers wonderful amenities for guests. Among these amenities, be sure to check out the beautiful Old Blue Golf Course, two pools and jacuzzi spas. Feel free to use the barbeque grills to cook your favorite meals! 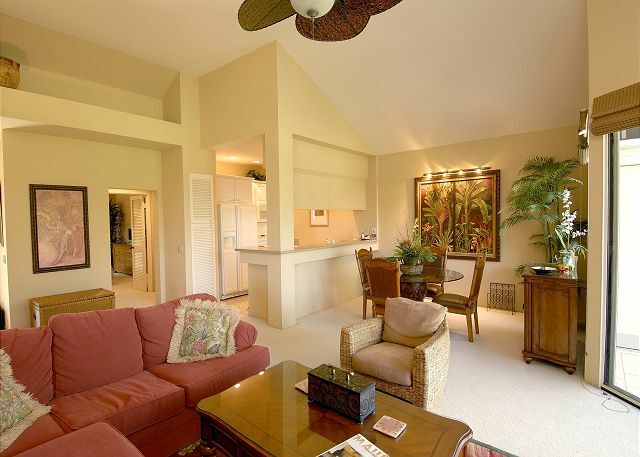 The resort has everything you need and is very convenient to make your vacation to Maui one to remember. A washer and dryer are also available for guests to use. This condo is well-kept and beautifully decorated. You will feel right at home from the moment you step into this beautiful condo. 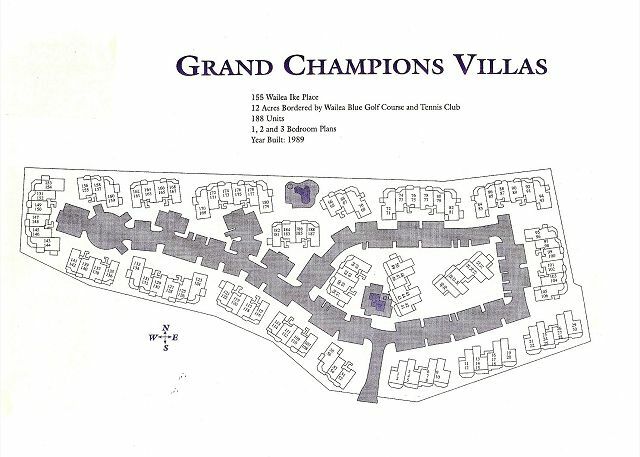 Grand Champions 86 is within walking distance to the sandy beach. If you encounter a rainy day at Maui, take advantage of The Shops at Wailea located nearby. 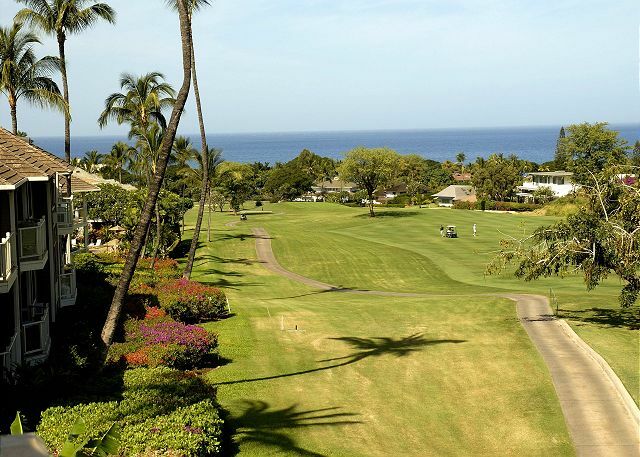 Play a round of golf, practice your serve on the tennis courts or view the beautiful sea life while snorkeling. So many great options await you! Whether you are off on a romantic getaway or adventure seeking in Maui, Grand Champions 86 is perfect! The amazing master bedroom, large master bathroom and the beautiful view of the ocean make Grand Champions 86 the perfect place to call home during your stay! Be sure to call now to book your stay! Be prepared for a vacation to remember!